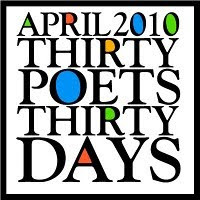 30 Poets/ 30 Days (2010 Edition), a poetry event at the blog GottaBook, was highlighted in Writers Celebrate National Poetry Month With 30 Poets/30 Days by School Library Journal. As explained at Gotta Book, "very day in April, I'll be posting a previously unpublished poem by a different poet." Gotta Book is the blog of Greg Pincus. Pincus, as you may remember, is the King of Using Social Media to Promote Awesome Things. Seriously -- even if you care nothing about poets, check out how Pincus is organizing and promoting 30 Poets/ 30 Days. Especially how the promotion is not about him -- it is about the poets, and poetry, and the whole kidlitosphere book blogging community. That, my friends, is how to use social media. And for Pincus I have two words. Ge.Nius. But it IS genius. Anyone who has been involved in this type of blogging event knows that it is a heckuva lot of work. What does Pincus say about that? It's "a project of fun and joy not of stress and deadlines." May we all remember the fun and joy in blogging. Thank you, GottaBook -- 30 Poets/ 30 Days has been amazing so far and I cannot wait to read the rest of the poems. Aww, you're too kind. I shall do the only appropriate thing - send this link to my mom! The project is a lot of work, but I do love it - I get to spread poetry, ya know? And so many people throughout the Kidlitosphere do so many wonderful projects that it's nice to be able to do the heavier lifting every now and then. And, well, this project IS fun - as in, I've already seen the poems that are still to come and they're also amazing! What could be better than that? Thanks for the links and support!